While this Trunk Club Clubhouse post is sponsored by Trunk Club, all thoughts, words, and opinions are honest and my own. As I mentioned in my workout journey blog post, I haven’t lost a lot of weight since starting to regularly go to a gym, but my body has changed quite drastically. I’m someone who provides fashion advice for a living, but personally I was struggling to get dressed each day. Much of my current wardrobe no longer fit, and that which did didn’t fit the same way or provide the same effect. I was in need of a major refresh right when Trunk Club reached out offering me to try their service. Many of you have asked me to review Trunk Club and many of you have shared your experiences with the company. I was intrigued, and even more excited to find out that I don’t live too far from one of Trunk Club’s seven in-person Clubhouses. For those unfamiliar with Trunk Club, the company began in Chicago in 2009 as a personalized clothing service for men. In 2012 it expanded to offer custom clothing for men (and still has this feature), and by 2014 the company was acquired by Nordstrom and opened locations in Dallas, Los Angeles, DC, and Chicago. 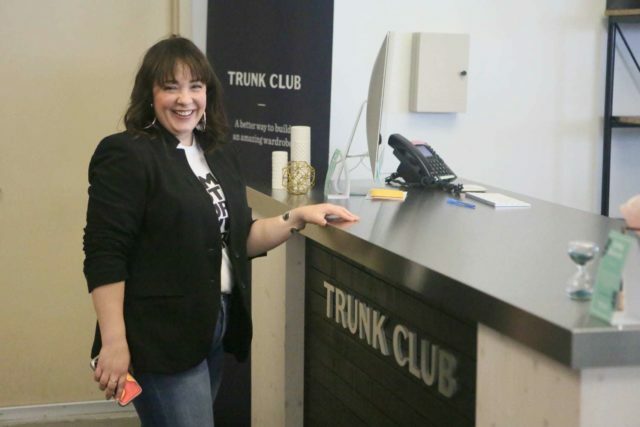 In 2015, Trunk Club expanded to include clothing services for women. Now, Trunk Club is a leader in virtual styling with Clubhouses also in Boston, Charleston, and NYC. Whether you use the virtual program or visit a Clubhouse, you work with a real stylist, not an algorithm. 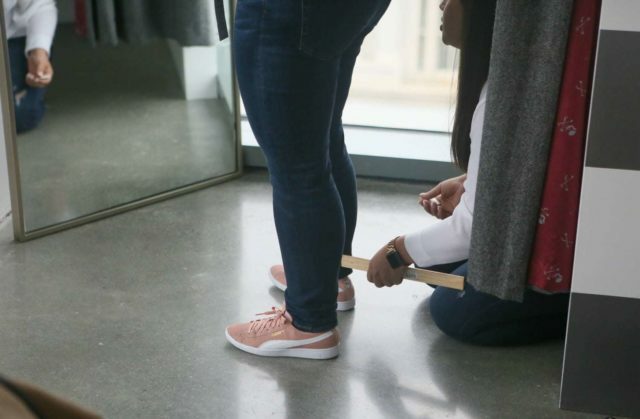 This stylist keeps notes on you – your size and when it changes, what you order, what works, what doesn’t. He or she works to get to know you before your first Trunk or visit, via phone call or the convenient chat function part of the Trunk Club website. I didn’t try the virtual aspect of Trunk Club, so for the rest of this post I will focus on the Trunk Club Clubhouse experience. Even when you are visiting a Trunk Club clubhouse, you still create an online profile. The profile asked for all my sizes from bra to shoe. I loved that it was possible to have some sizes plus, others regular, others petite. You don’t have to choose a specific label when it comes to Trunk Club, and it’s easy to change your sizing. 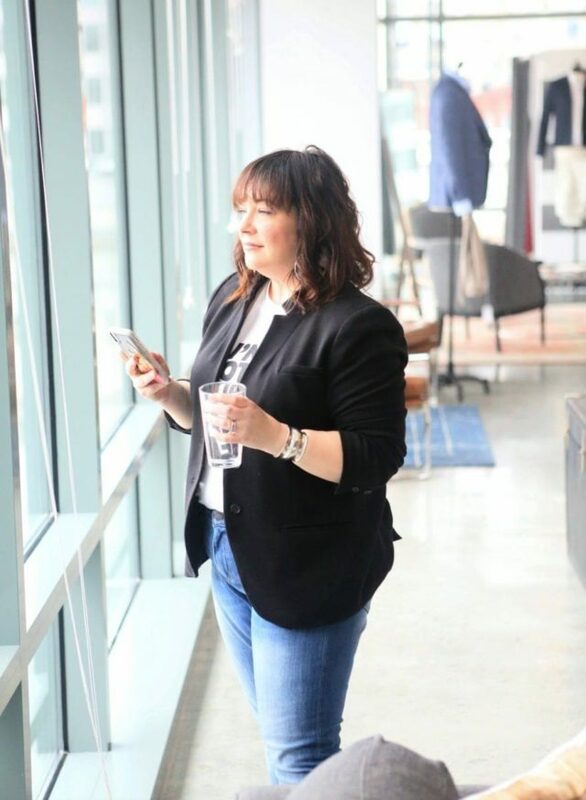 I was able to also connect to Pinterest which is a great way to show style icons, current wardrobe, and ideas for a future wardrobe. 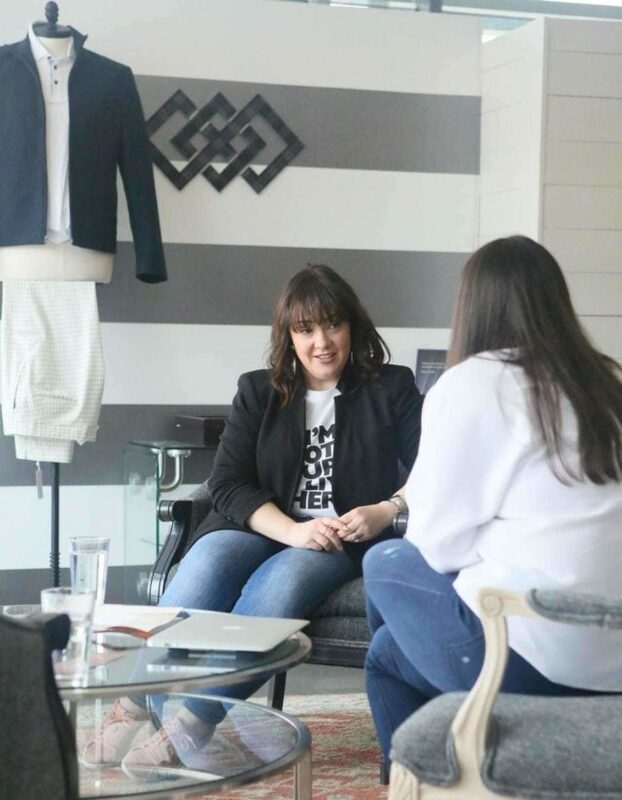 I was connected to a stylist named Kelsey and we began a chat within the Trunk Club website. This chat feature is awesome because it’s a running conversation that is persistent, so you can look back for reference. I provided my blog, my Instagram handle, and to be transparent I let her know I was being sponsored by Trunk Club (they provided payment for the post and some store credit). Kelsey was quick with responses, and quick with great questions to better pick the items for my first visit to the Clubhouse. Was I looking for work or weekend looks? What colors or patterns do I gravitate towards? How would I describe my body type, how do I like clothing to fit, and are there any parts I’d like to conceal or highlight? Any trends I’d like to avoid or try? Do I want accessories in my Trunk and what kinds of shoes do I like? I didn’t have to fill in a blank, I could get really wordy (y’all know I love to write novels!) and share my style icons, how I’m working out and don’t know my current body, how I am over the cold shoulder trend but will forever love off the shoulder, how I desperately need some jeans that fit, and how I need clothes that can go from the coworking space to a fashion event more than looks for a casual weekend. Kelsey always replied enthusiastically, which honestly made me share even more. Hey, the better she knows me the better my Trunk, right? Armed with all this information about me and my style, we scheduled a 90-minute appointment. 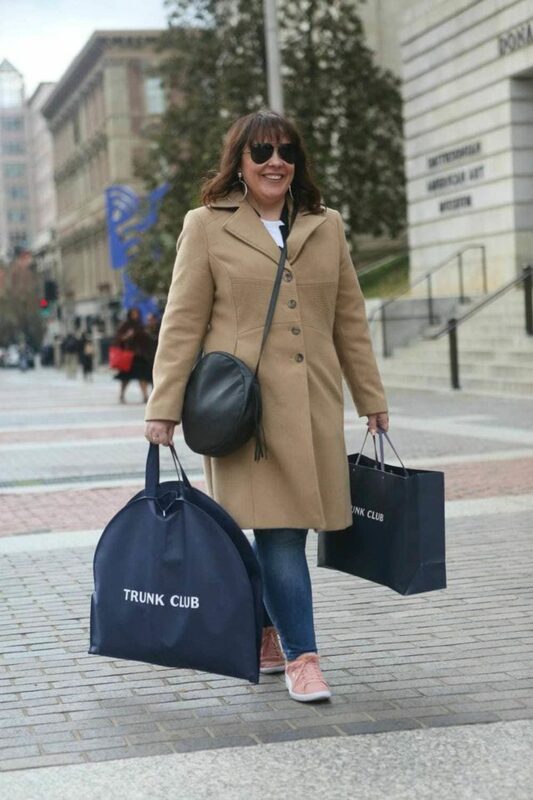 On a Wednesday afternoon, my husband and I headed to the DC Trunk Club Clubhouse. Conveniently located next door to the Spy Museum, the Clubhouse is only two blocks from the Gallery Place Metro stop. The building is clearly labeled Trunk Club, and when you make your appointment they let you know which floor to go up to in the elevator. When you get off the elevator, you are inside the Trunk Club loft. The Trunk Club Clubhouse in DC is an enormous, airy space with a wall of windows overlooking the National Portrait Gallery. There’s a desk when you enter, and the receptionist will check you in and invite you to the bar. Yes, Trunk Club has a bar where you can get a cocktail, glass of wine, a La Croix, water, or most anything else. We were early, so we checked out the space and enjoyed a cold beverage. The Trunk Club Clubhouse loft is broken into little sections, each with a different décor style, and each with a dressing room and large mirror. These areas are like mini living rooms with chairs or couches, low tables, and plenty of space between them. Each section could be taken by a stylist and his or her client and it wouldn’t feel crowded and you wouldn’t feel like anyone can overhear your conversation or be watching your styling session. Kelsey greeted us and guided us to a styling area where she already had a garment rack of clothes. We sat first, got to know one another and I had plenty of time to ask questions and become comfortable. 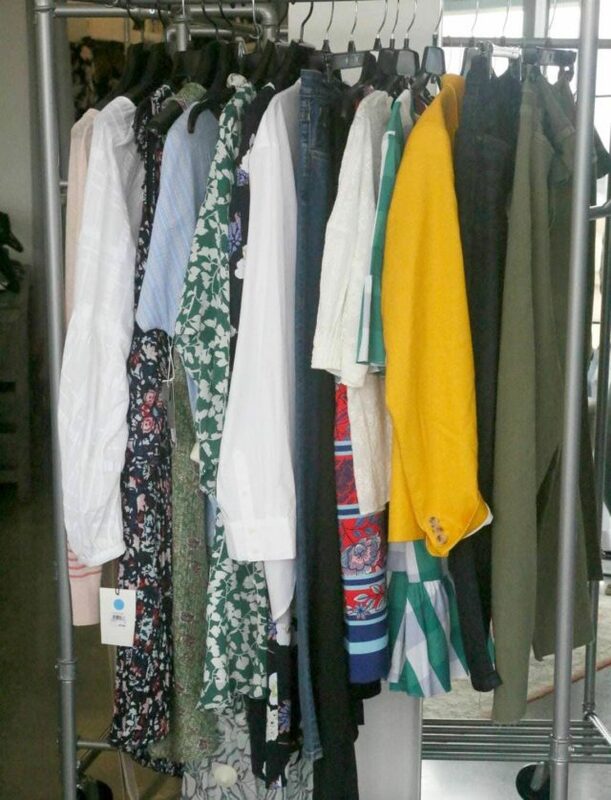 The rack wasn’t stuffed, just enough pieces to try to fill holes in my changing wardrobe and achieve my goals of jeans that fit, spring and summer dresses that can easily go from working all day at The Wing to a blogger event, and maybe a statement jacket or top. Kelsey walked through each piece and explained her thought process for adding it to the rack. And then we started trying on! The Trunk Club Clubhouse fitting room is a comfortable size with plenty of hooks and a bench. However, there is no mirror in there… for good reason. Your stylist wants to see everything, good and bad to better understand how items fit your body and your personal style. The space was set up that I could come out in something unzipped or not fitting and not feel like I was on display. The DC Trunk Club Clubhouse has some merchandise in the back, but it’s not like an entire Nordstrom is back there. Kelsey was able to snag another pair of shoes for me from back there, but when one dress I loved was the wrong size, she had to order it for me. Just as with a Trunk mailed to you, the items are pre-picked based upon the information in the chat and your profile. If you try on a pair of jeans and they’re too long, or a blazer needs a little adjustment in the sleeve, no problem. Trunk Club Clubhouses have in-house tailors. Basic alterations are free, more complex alterations cost but usually at a price cheaper than at your local tailor. When items are complete they will mail them to you for free. All Trunk Club purchases, whether from a Clubhouse or online can be taken to your local Nordstrom as well for free or reasonably priced alterations. I tried seven dresses, three pairs of jeans, one blazer, two pairs of shoes, one sweater, and four tops. No, not everything worked but that’s actually a good thing. The experience helped both Kelsey and myself understand my body, and what I am really looking for. What we think we want and what we actually want are often two different things, and that clarity only happens in the fitting room. I ended up leaving with an amazing pair of jeans from a brand I never tried before but fits me like a glove (though I did have them shortened by the in-house tailor – Kelsey knew the perfect length for my figure and shoe style), a pair of nice sneakers that I would never have given a second glance but now wear ALL. THE. TIME., a fantastic blazer in a color I never wear but found I not only love on me but it goes with so much of my current closet, and a dress that I needed a smaller size so it’s was ordered and mailed to me for free. I must admit, even I, someone who trolls through Nordstrom and other online boutiques on the daily was pleasantly surprised by how spot-on Kelsey was with not just what I said I wanted but what I actually needed. Do note, the only money spent is the money on the clothes. There is no fee for the stylist, for the appointment at the Trunk Club clubhouse, and as I mentioned, no cost if you require basic alterations or an item to be shipped to your house. 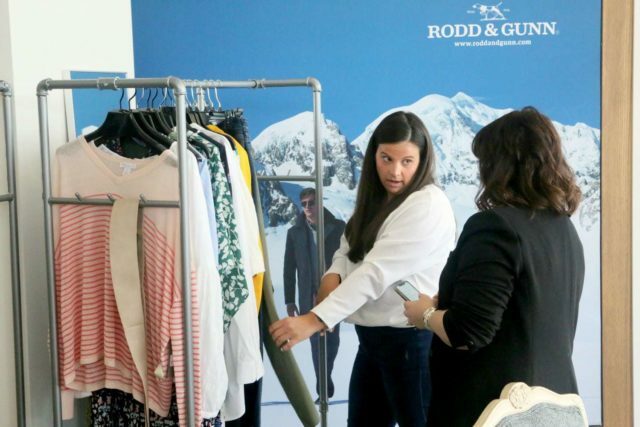 None of the items I got I would have considered on my own, and that is what I think all of us are looking for when we consider services like Trunk Club. We’ve spent years shopping for and dressing ourselves, but we’re lacking something. A second opinion, a wardrobe refresh, a step outside the box. And I found that something with Trunk Club. I love that the site tracks all my purchases, so my stylist can suggest pieces to work with what I have already bought. I love the easy communication – no generic feedback forms that you don’t know if they’re read, no computer-generated algorithms building you boxes of the same clothes everyone else is getting. The experience was definitely personalized and personal. Though I was only sponsored for one visit, I doubt this will be my last because the result was so positive. I’m really glad Trunk Club partnered with me so I could experience their Clubhouse. If you have tried Trunk Club, either by mail or at one of their Clubhouses, do share the experience in the comments! I’m so curious, have you ever tried working with a personal stylist in Nordstrom? If so, how did the Clubhouse experience compare? Asking because I’m in DC and am debating between the two options. I tried the virtual Trunk Club option a few times and pretty much struck out, but I’m wondering if I’d have better luck in person. i love your black blazer. where is it from? the whole look is really cute on you. I’ve tried Trunk Club online and they are so great with suggestions and customer service. I’ve had varied results but I’m learning to be more specific and that helps them send items that are more to my liking. I will definitely continue to use this service. You left us hanging. I want to see what you purchased! It sounds like a good experience. Thanks for sharing. I know, sorry about that! Tomorrow’s post will have the dress and sneakers I purchased. I’ll have the blazer and jeans on the blog very soon! I used the virtual stylist and had no success though found it to be a pleasant and easy experience. I favor a more androgynous aesthetic (which i indicated)and most everything I was sent was VERY girly. I’m not sure this is the best option for me. I think the fail has more to do with my style than the service itself. I ended up sending the entire trunk back. Perhaps I’d have better luck at an in-person experience. Oh that’s frustrating! I don’t know how you can go about changing stylists with Trunk Club, but I feel just as with a personal shopper anywhere their aesthetic is going to affect their picks. And sounds like you had the wrong stylist for your style! Ooh, they have one near me! Going to check it out for sure! !